A new series of quilts is coming along. 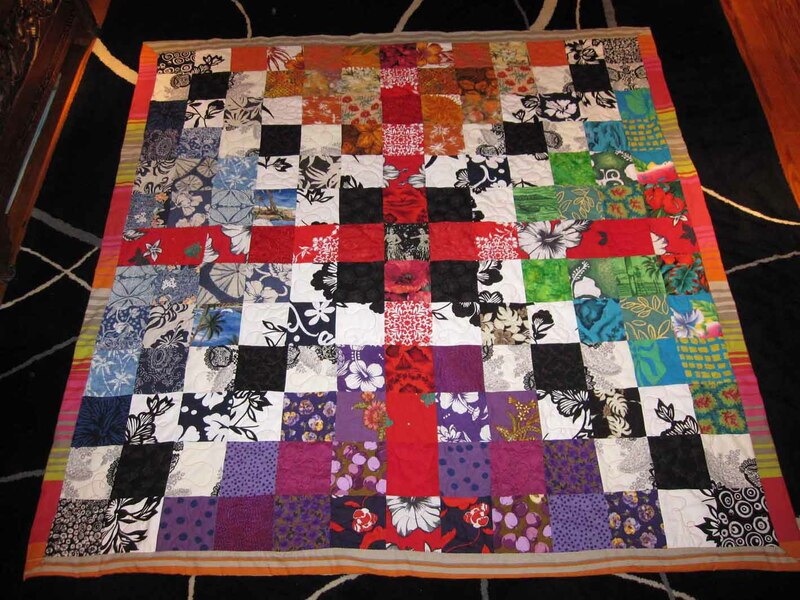 Using a basic format of four foot by six foot, quilted with an undulating wave patterned after utilitarian packing blankets, these quilts can withstand serious use. Because I’ve been collecting for a long time, there’s a lot of patterns and colors to choose from. Rather than control the whole process from beginning to end, this series gives numerous other people an opportunity to participate. The best part, for me, is seeing how people identify with certain fabrics: their choices are a reflection of their own aesthetic. At the Mercer County Teen Arts festival this year, I asked 40 students to select fabric from a big pile. They picked at random; ironing, cutting, pinning and joining their two fabrics with the available iron and sewing machine. They did all the work themselves, with supervision but little intervention on my part. Here is the result: I added the blue fabric with the poppy print to help unify the composition. The back is composed of fabric given to me by friends, which is both cheerful and funky with the repeating pattern of squirting tubes. 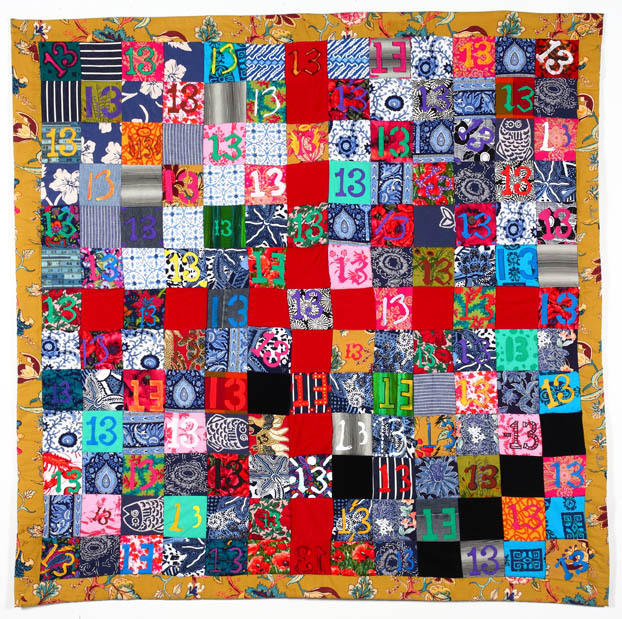 My friend Harriet completed her second quilt, and gave me the leftover fabric – including some 12″ squares she’d made following a checkerboard pattern in a distinctive palette including acid green, turquoise, harvest gold and lemon yellow. 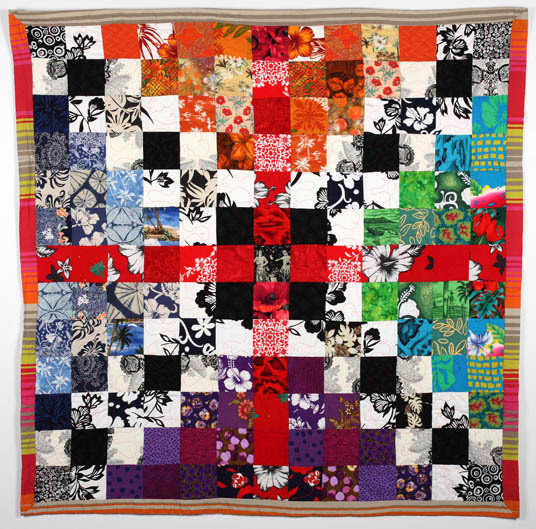 Alternate 12″ squares were pieced from my collection of curious scraps. 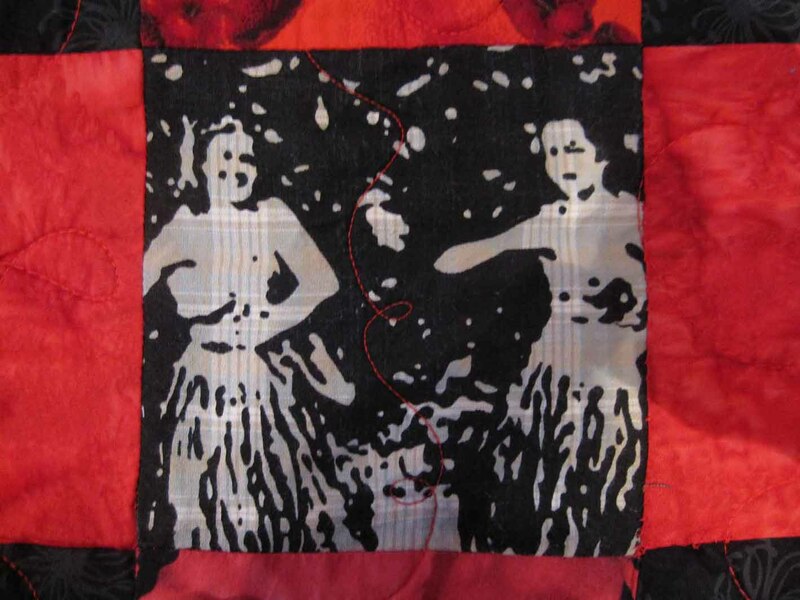 The “Hula Ladies” quilt will be included in the Celebrating Nature’s Beauty in Stitches 2011 Quilt Show at the Jenkins Arboretum & Gardens in Devon, PA. A reception for the quilters will be held 7-9PM on Friday, February 4, 2011. Please RSVP your attendance at the reception by e-mail to webinfo@jenkinsarboretum or calling 610 647-8870 by January 24, 2011. There is no charge for the reception, and hors de oeuvres and drinks will be served. I’m planning on going, and have room in the Volvo if anyone wants a ride (contact me via e-mail, please! ).